The Mia is the perfect complement to any look. Designed in a classic shape with a modern architectural edge, the clean sleek lines make it transitional from the office to an elegant evening cocktail party. Crafted out of brass, it is dipped in 14K gold with a chain draping from a hand-sculpted frame. 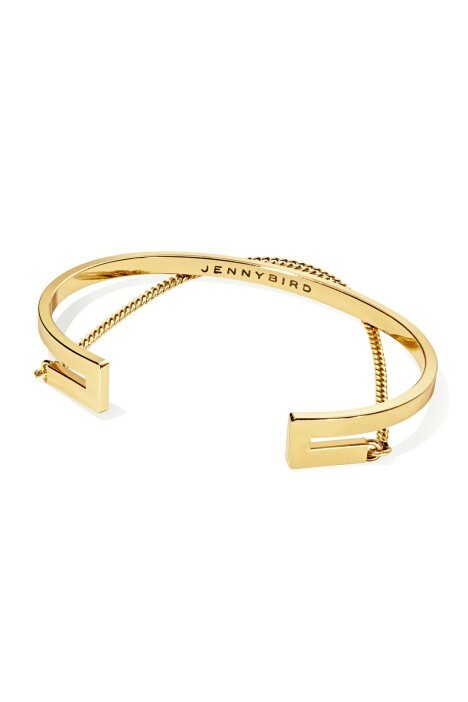 Finished in high polish, Jenny Bird’s signature logo is engraved on the inside for a personal touch. This piece is the perfect finishing touch to rent for your gorgeous delicate lace mini dress, or your colourblock midi! Hire this gorgeous piece with a gold-accented clutch to bring out the subtle details of your ensemble, and give you an unfortgettable look! For more outfit inspiration, check out our 'Summer Cocktail Dress Style Guide' blog post!